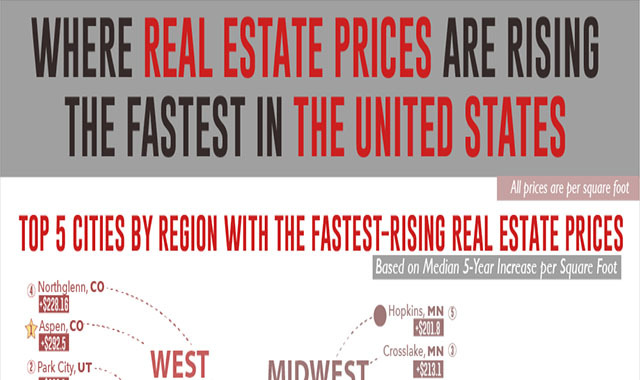 The Strongest and Weakest Real Estate Markets in America #Infographic ~ Visualistan '+g+"
America. The land of the free. Also, the land of dreams and of opportunities. But, most importantly, the vast land that embraces everybody. So, how much would it take to purchase real estate in the US? What is the growth rate, and is it uniform across all the states? These questions are answered in this infographic, that evaluates real estate prices across various parameters: the most expensive 5 cities region-wise; the top 10 and the bottom 10 cities based per square feet prices; the top and bottom 10 based on rising or declining rates.